Find out what is new with our Buy Idaho members and how you can support their Idaho businesses. Shop Small in the heart of it all Downtown Boise ! For communities to thrive, their small businesses need to thrive. That’s the idea behind Small Business Saturday. And the idea has caught on! · 43% of adults, or an estimated 108 million consumers reported shopping or dining at local independently-owned businesses, generating roughly $12 billion in reported spending. · 70% of U.S consumers are aware of Small Business Saturday, and in addition to support on Main Streets, shoppers turned out for online small businesses – with 35% reporting that they Shopped Small® online on November 25th alone. · 90% of consumers surveyed said Small Business Saturday has had a positive impact on their community. · 73% of consumers who reportedly Shopped Small at independently-owned retailers and restaurants on Small Business Saturday did so with friends or family. · Shoppers made Small Business Saturday an all-day affair, as 58% of those who participated in the day reported shopping or dining at more than one small, independently-owned retailer or restaurant on Small Business Saturday this year. · On a national level, nearly half (48%) of consumers who participated in Small Business Saturday reported visiting a small business that they had not previously been to on Small Business Saturday. Downtown Boise is the largest concentration of small, independent business in the state of Idaho. Dozens of businesses in every district of Boise’s Downtown are taking part in Small Business Saturday. Many offer guests festive, exclusive promotions and events designed to make the experience a special one. Stamped Passport? Win a Downtown Boise Gift Card! The Small Business Saturday Downtown Boise Passport is available at participating merchants. Pick up the Passport, collect the number of stamps from individual merchants, then enter to win one of six $50 Downtown Boise gift cards. Go to downtownboise.orgfor a list of participating merchants. Completed Passports are collected at Rediscovered Books at 8th & Idaho Streets. Downtown Boise gift cards are good at more than 300 merchants! “Small Business Saturday in downtown Boise is a fun day to meet friends and family, and enjoy a day that’s as much about community as it is shopping. Merchants downtown always give their visitors a great experience as well as unique, fabulous finds, and it’s always more meaningful knowing our purchases directly support our neighbors,” said Lynn Hightower, Executive Director of the Downtown Boise Association. *data from the 2017 Small Business Saturday Consumer Insights Survey, released today by the National Federation of Independent Business (NFIB) and American Express (NYSE:AXP)Boise Metro Chamber of Commerce to make the day a success. IBL Events will host the Fall 2018 After Hours Idaho Job and Career Fair on Thursday, November 15th from 4pm to 7pm at the Courtyard by Marriott, 1789 S Eagle Rd, Meridian, Idaho 83642. This FREE event is open to the public and job seekers will have the opportunity to network with over 45 companies seeking individuals to fill their open positions. If you are looking for a job or a career change, employers and human resource representatives from a wide assortment of industries will be on hand to speak with you. They will be recruiting for positions in healthcare, information technology, hospitality, customer service, communications, construction, manufacturing, and more. These employers are looking to fill an array of full-time and part-time positions. Up North Distillery Takes Home Some New Hardware! October 24, 2018 POST FALLS, UP NORTH DISTILLERY is pleased to announce that our company has recently won two Silver Medals & Judges’ Pick in the 2018 SIP Northwest Spirits Competition as well as a Silver Medal & two Bronze Medals in the inaugural National Honey Board Spirits Competition. Sip Northwest magazine is excited to release its seventh annual Best of the Northwest awards issue. This collector’s edition showcases the winners of the grand tasting competition from wine, beer, spirits and cider, along with top Northwest beverage trends, locally focused restaurant and bars, producers to watch, elite drink destinations to visit and when, plus much more. Up North Distillery products are available on site at their distillery in Post Falls where you can enjoy a free tasting, a signature cocktail and a bottle to go. Their products are also available in Idaho liquor stores. For additional information visit www.upnorthdistillery.com as well as Facebook https://www.facebook.com/upnorthdistillery/. Idaho’s Largest Baby Boomer & Senior Expo Coming to Boise! Boise, Idaho – IBL Events is proud to host the 1st Annual Golden Years Lifestyle Expo October 20th at Expo Idaho. This premier healthy living, retirement and planning event proudly offers FREE Admission. This event is open to the public and welcomes all baby boomers, seniors and individuals planning retirement to attend Saturday from 9am-4pm. At the Golden Years Lifestyle Expo guests can shop over 100 exhibits. Explore the latest in RV’s, healthcare, home remodeling, activities and entertainment. Check out local artisans and crafters plus sample sweets and savories. The Golden Years Lifestyle Expo offers free health screenings including: balance evaluations, bone density and hearing tests and skin damage checks by Treasure Valley Dermatology and Skin Cancer Center. Guest won’t want to miss a packed day of free educational seminars. Topics covered are estate planning basics, Medicare 101, fracture prevention, senior travel tours, fracture, balance, fall and risk prevention strategies and wellness using oils. Hands on workshops are available for registration and include making your own succulent arrangement and learning how to create custom cupcakes from a pro. Enjoy a free game of bingo every fifteen minutes and win prizes! For a complete list of seminars and workshops visit iblevents.com. Treasure Valley locals don’t want to miss this event designed specifically to enjoy the golden stage of your life. The FREE Golden Years Lifestyle Expo, Saturday, October 20th from 9am to 4pm at Expo Idaho. 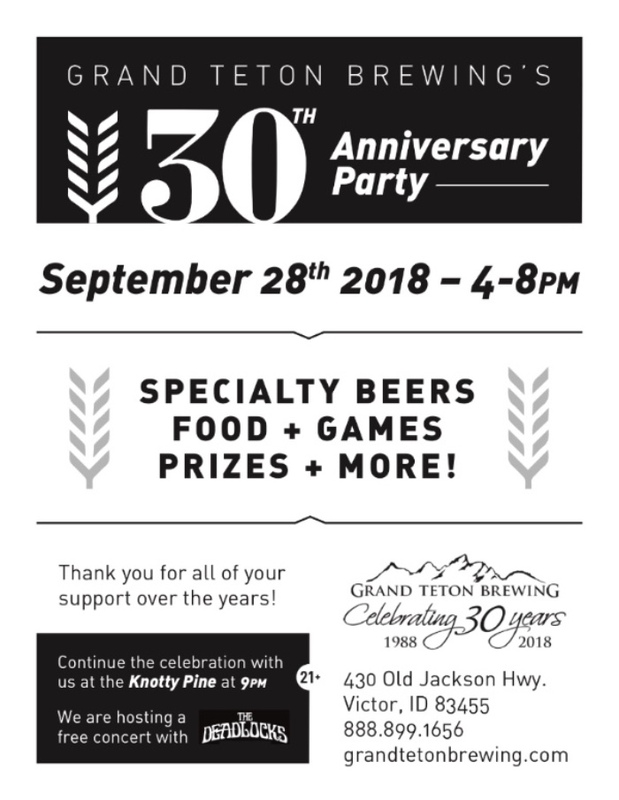 Grand Teton Brewing is turning 30! Boise Brewing awarded Bronze at the Great American Beer Fest! Boise, ID • September 22—Boise Brewing received a bronze medal at the 2018 Great American Beer Festival (GABF) competition. Presented by the Brewers Association, GABF is the largest commercial beer competition in the world and recognizes the most outstanding beers produced in the United States. The top three winners in the competition’s 102 beer-style categories were announced September 22 at the Great American Beer Festival awards ceremony held at the Colorado Convention Center in Denver, Colorado. Boise Brewing was recognized in the American Stout beer-style category for its Black Cliffs, a roast-y, hoppy treat. It is well balanced with rich chocolate and coffee tones and plentiful Northwest hop character. Pine and citrus aromas play well with the dark malt aromas and the body and mouth feel are all a stout should be. This was brewed as our first Community Supported Beer and still one of Lance’s favorites. Boise Brewing accepting the Bronze Medal for Black Cliffs American Style Stout. This is the fourth year in a row Boise Brewing has received a medal at GABF. The 2018 GABF competition winners were selected by an international panel of 293 expert judges from 8,496 entries, received from 2,404 U.S. breweries, plus 101 Pro-Am and 49 Collaboration entries. For more GABF competition information, including the 2018 winners list and photos, visit GreatAmericanBeerFestival.com. Nestled in the heart of downtown Boise, “halfway between the campus and the capital,” Boise Brewing is the only community owned brewery in Idaho. Now with over 450 owners holding stock in the company, they are looking to expand the notion of “community supported beer”. Recently awarded a gold medal in the World Beer Cup Awards 2018 for their Black Cliffs American Style Stout they are staying true to their commitment to quality as their geographic reach gets longer. For more information on Boise Brewing, please visit www.BoiseBrewing.com. Idaho Dream Wedding Expo is Back and Bigger Than Ever! Boise, Idaho – The Idaho Dream Wedding Expo is the fall bridal event of the year, October 6th and 7th at Expo Idaho, 5610 Glenwood, Boise, ID 83714. Doors open Saturday from 10am to 5pm and Sunday 11am to 4pm. Admission is $6 and advanced tickets are available for purchase at Eventbrite.com. Save $1.00 off admission with promo code “EARLYBIRD” now through September 30th. Free Parking available. Future bride and grooms are invited to attend the Idaho Dream Wedding Expo. Visit with over 75 sponsors and exhibitors all there to help your happily ever after come true. Guests can discuss future wedding plans and visit with photographers, videographers, caterers, florists, pastry chefs, venue owners, and entertainment providers. View rental equipment, lighting, décor, gowns, tuxes and more. Regardless of the wedding you’re planning there is something for everyone at the Idaho Dream Wedding Expo! This event is the place for future brides and grooms to navigate through almost anything they are going to need to plan their wedding and start out their new lives together. Lastly, attend the Dream Wedding Expo and purchase your “Lee Read Jewelers Dream Giveaway” raffle ticket to be entered to win a $2,000 His & Hers Wedding Band package. You do not have to be present to win but must purchase your ticket at the Dream Wedding Expo on October 6th & 7th. 100% of the proceeds will go to support Ride for Joy, a local therapeutic equine riding program! For more information regarding the giveaway please visit iblevents.com. Sponsored by: IBL Events, Lee Read Jewelers, Go Out Local, Wild Roots Vodka, Azunia Tequila, My 102.7, Wild 101, Boise Events Resource Center, Chateau des Fleurs. Boise, Idaho – IBL Events is proud to host the 26th Annual Idaho Health & Fitness Fair October 6th & 7th at Expo Idaho. This is a must attend for the Treasure Valley’s health and fitness conscious community. This FREE event is open to the public on Saturday from 10am to 5pm & Sunday 11am to 4pm. “This is the premier health event for all age demographics and where you can meet face to face, attend seminars, and interact with over 100+ health and fitness companies,” said show producer, Anna Marie Aldinger. The Health & Fitness Fair is for health minded individuals looking for products and resources to help them achieve their fitness goals and adopt a healthier lifestyle. This event is about Idahoans having fun and spending time together while learning about better food choices, health, and fitness options. The Health Fair will feature tools and guides to revamp your life from the inside out. The Health Fair exhibits include companies representing: sports nutrition, personal care products, gyms and health clubs, medi-spas, health practitioners, personal training, physical therapy, wellness products, health screenings, weight-loss products, health foods, pain management, meal prep, senior resources and more. Also, if you plan on attending the health fair, don’t forget to check out the Old Skool Iron Strongman Classic on October 6th at Expo Idaho. This is also a free event and is open to the public. Come see the Treasure Valley’s strongest men and women compete in events such as the Log Press, Car Dead Lift, Sand Bag Carry, Atlas Stone Throw, & Truck Pull. Sponsored by: IBL Events, Old Skool Iron Boise, Go Out Local, Express Employment Professionals, Wild 101, My102.7, Fireball Whisky, Chiseled Nutrition.